About - Sencia Canada Ltd.
We are a full service creative and innovative software development company located in Thunder Bay, Ontario, Canada. We provide web development services such as; project management, conceptual planning, design, custom programming, web / email hosting, marketing and SEO. Our in-house developed suite of applications also give us the ability to provide our clients with a truly unique and powerful solution for any size business – armed with the ability to grow along with it. As a team, we all believe in helping our clients achieve success through web based solutions that are; easy to use, dependable and have the capability to grow along with our clients. We value quality, security and flexibility. Sencia's primary office is located in the heart of Thunder Bay's business district by the waterfront. We feel pretty lucky to be located in such a creatively inspiring and naturally beautiful place. Thunder Bay is surrounded by an abundance of arts & entertainment, an outwardly generous community and steady economic growth. We adore our community and always look forward to working with local clientele and giving back where we can! Providing quality Thunder Bay web design & development services. 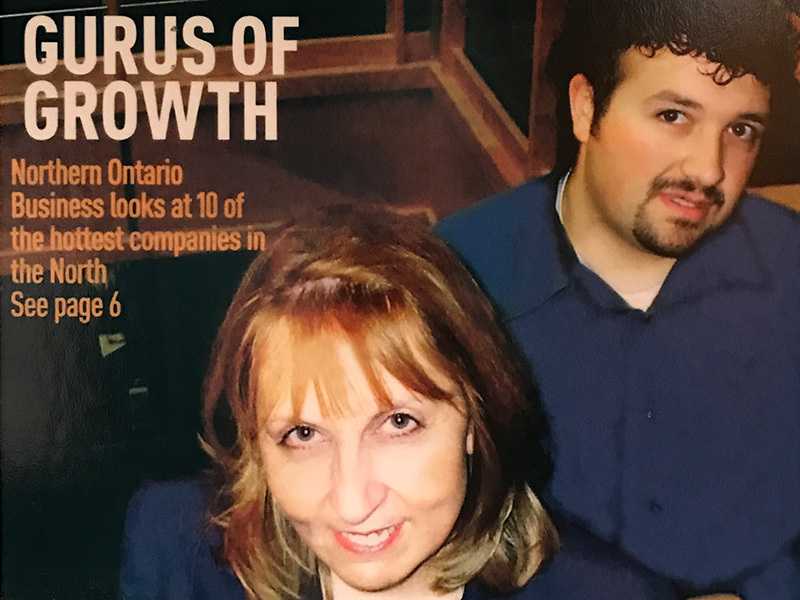 Sencia Canada Ltd. was established June 2001 in Thunder Bay by Joe Quaresima and Irene Kozlowski. Desiring to provide professional online services to their local community, they teamed up to fill a void of quality website services within Thunder Bay. As the company grew, they welcomed employees with similar drives and passion for the web industry. Together with their clients and staff, Sencia has worked to develop leading professional software solutions that have made waves in management, productivity, teamwork, and learning in online environments. They are; Informetica Learning Management System, SIMS Content Management System, Sencia Track Data Management System and DocShare Secure Document Sharing. Primarily providing their services to Thunder Bay, Ontario, Sencia has helped hundreds of local businesses reach their online goals by providing them with Thunder Bay websites, search optimization services, accessibility audits, online learning tools, ecommerce solutions and more. Their exceptional services and passion for their trade have attracted clients in America, Europe and worldwide. While providing local website solutions to Thunder Bay always remains a major focus, this new wordly attention allowed Sencia to expand their services to new markets and eventually see their products used by hundreds of thousands of individuals across the globe. Continued growth has allowed them to see numerous upgrades to their services including improved hosting servers, work environments, development programs, tools and other resources. This growth has also allowed us to hire new talents which introduce new skills, services and ideas and inspirations. Today, the company consists of 20+ full-time employees in two divisions. Their main office is located in Thunder Bay, Ontario, Canada. Sencia has provided services for hundreds of unique projects and has a steady list of active and ongoing clients. The company continues to look forward with innovative technologies, constantly looking for ways improve your experience with online management and the web. 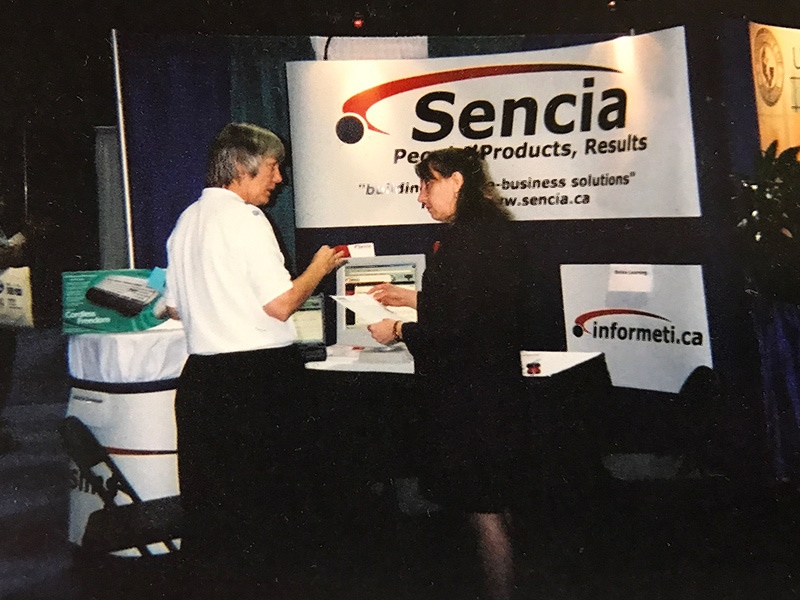 Irene Kozlowski discusses Sencia's products with an individual at a conference in early years.